The NITI Aayog today unveiled its comprehensive national Strategy for New India, which defines clear objectives for 2022-23. It is a detailed exposition across forty-one crucial areas, that recognizes the progress already made, identifies binding constraints, and suggests the way forward for achieving the clearly stated objectives. The ‘Strategy for New India @75’was released today at a press conference by the Union Finance Minister Shri Arun Jaitley, in the presence of NITI Aayog Vice-Chairman Dr Rajiv Kumar, Members Dr Ramesh Chand and Dr VK Saraswat and CEO Shri Amitabh Kant. 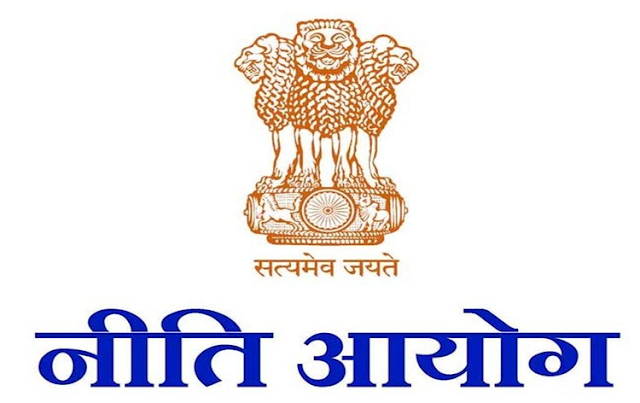 Drawing inspiration and direction from the Prime Minister’s clarion call for establishing a New India by 2022, NITI Aayog embarked on a journey of formulating the Strategy document over the last year. NITI Aayog followed an extremely participative approach in preparing the strategy. Each area vertical in NITI Aayog had in-depth consultations with all three groups of stakeholders, viz., business persons, academics including scientists, and government officials. This was followed by consultations at the level of the Vice Chairman with a diverse group of eminent persons from seven sets of stakeholders that included scientists and innovators, farmers, civil society organizations, think-tanks, labor representatives and trade unions, and industry representatives. Central Ministries were brought on board for inputs, suggestions and comments, with each draft of individual chapters being circulated for consultations. The draft document was also circulated to all the States and Union Territories from whom valuable suggestions were received and incorporated. 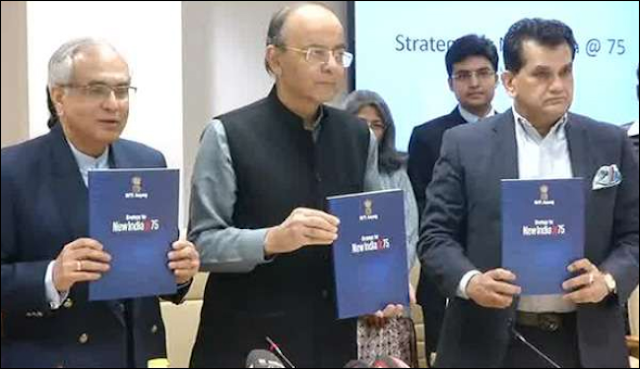 Over 800 stakeholders from within the government – central, state and district levels – and about 550 external experts were consulted during the preparation of the document. Steadily accelerate the economy to achieve a GDP growth rate of about 8% on average during 2018-23. This will raise the economy’s size in real terms from USD 2.7 trillion in 2017-18 to nearly USD 4 trillion by 2022-23. Increase the investment rate as measured by gross fixed capital formation (GFCF) from the present 29%to 36% of GDP by 2022. In agriculture, shift the emphasis to converting farmers to ‘agripreneurs’ by further expanding National Agriculture Markets and replacing the Agricultural Produce Marketing Committee Act with the Agricultural Produce and Livestock Marketing Act. Give a strong push to ‘Zero Budget Natural Farming’ techniques that reduce costs,improve land quality and increase farmers’ incomes. This has emerged as a tested method for putting environment carbon back into the land. To ensure maximum employment creation, complete codification of labor laws and a massive effort must be made to upscale and expand apprenticeships. Expedite the establishment of the Rail Development Authority (RDA), which is already approved. RDA will advise or make informed decisions on an integrated, transparent and dynamic pricing mechanism for the railways. Double the share of freight transported by coastal shipping and inland waterways. Initially,viability gap funding will be provided until the infrastructure is fully developed. Develop an IT-enabled platform for integrating different modes of transport and promoting multi-modal and digitized mobility. With the completion of the Bharat Net program in 2019, all 2.5 lakh gram panchayats will be digitally connected. Aim to deliver all government services at the state, district, and gram panchayat level digitally by 2022-23. Implement the recommendations of the Second Administrative Reforms Commission as a prelude to appointing a successor for designing reforms in the changing context of emerging technologies and growing complexity of the economy. Set up a new autonomous body, viz., the Arbitration Council of India to grade arbitral institution and accredit arbitrators to make the arbitration process cost effective and speedy, and to preempt the need for court intervention. Address the backlog of pending cases - shift part of workload out of regular court system.